The current source in some older designs and in some discrete amplifiers is simply a voltage source connected in series with a large resistance. 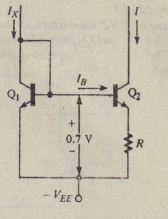 The Norton equivalent circuit of this arrangement shows that the constant current is EIR and that the source resistance is R. where E is the voltage source and R is the resistance in series with il. The difficulty with this scheme is that the value of the constant current is impractic.illy small if the resistance is made desirably large. Modern designs and integrated-circuit amplifiers use transistor constant-current sources, an example of \\ hich is illustrated. Transistor OJ has a large output resistance at its collector and is t hcrelorc a superior arrangement. 1. 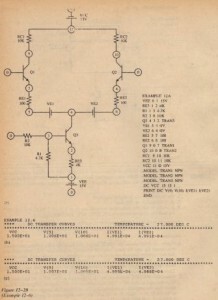 Figure 12-20(a) shows the SPICE circuit and input data file for the case where transistors QI and 02 have identical (default) parameters. VE I and VE2 are dummy voltage sources used to measure emitter currents in each side of the amplifier. As can be seen in Figure 12-20(b). the results of the .DC analysis show that the output voltages and emitter currents on each side are identical. Their values are very close to those calculated in Example 12-5. 2. When the .MODEL statement for 01 is changed so that I3F = 80 and that for 01 is changed so that BF 120, the results of the .DC analysis (Figure 12-20( c)) show that the amplifier is unbalanced. The difference in output voltages is seen to be 10.07 V – 10.05 V = 20 IIIV, and the difference in emitter currents is 0.4995 rnA – 0.4988 mA = 0.7J.A . 3. To investigate the effects’ of temperature change on the amplifier balance. the statement .TEMP 0 27 50 100 is added to the input data file. The .MODEL statements are modified so that 0\ and Q, once again have the same /3., but we now specify IS ~ IE-Io for Q\ and IS = 1.2E-16 for O2, The table in Figure 12-20(d) summarizes the results of the SPICE analysis at each temperature. 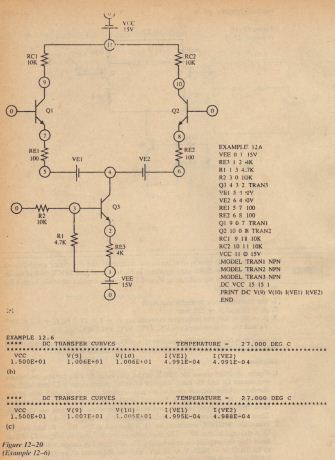 We see that both output voltages decrease and both emitter currents increase with increasing temperature. However, the most significant result from the standpoint of a differential amplifier is t!tat the output difference voltage and the difference in the emitter currents born. Thus. the degree of unbalance increases with increasing temperature. 3. the single-ended common-mode rejection ratio. Figure 12-21 shows a popular bias technique used in integrate- ircuits. Recall from Chapter (i that 0.1 and 04 form a current mirror, which has the advantage that current ls can he reflected through other transistors like 0.\ to supply bias current to other stages. 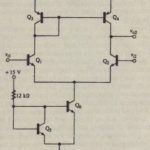 OJ is a diode-connected transistor. where Vr””, 0.026 at room temperature. Note that equation 12-28 cannot be solved for I using direct algebraic methods. To find the solution, a trial-and-error, or iterative, procedure is necessary, whereby values of I are tried until one that satisfies (12-28) is found. This kind of computational procedure is greatly facilitated by use of a computer.